Palmia Observatory: Some more on Falcon 9 launch; OCA lecture on Dark Matter and QFT; Precision Cosmology? Some more on Falcon 9 launch; OCA lecture on Dark Matter and QFT; Precision Cosmology? We had a fantastic experience during the recent Falcon 9 launch and re-landing at VAFB, as described in our recent post of October 8, 2018, and this week we can report on some comments we received and on some other ongoing physics and astronomy meetings and events. First up, we received an email from Big Oil Chemist, Dr. Arnold, who passed on a cell phone photo. 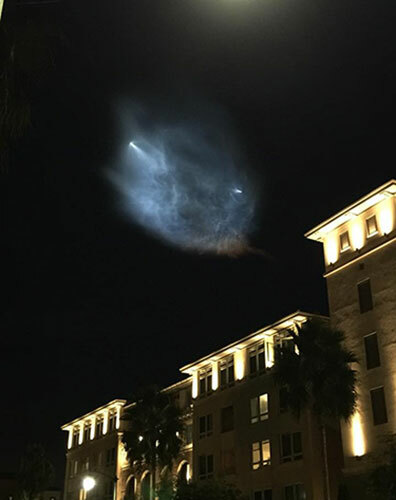 His granddaughter in the area north of LAX looked up in the sky and asked, "What is that? Well, we can see the rocket plume illuminated by the sun in a very spectacular fashion. Pretty neat, and we can see that you don't have to a big expensive camera setup to get some interesting pictures of the launch. Thanks for sharing, Arnold! We expect that many photographers will also be posting and sharing their photos in the next week or so. One of the most beautiful time-lapse videos that I have presently seen was identified and shared by Science Squad Gravity Guy, Ken, who forwarded this video reference. Check it out! It covers the events from early in the launch. Thanks for that, Ken! Also, during the last post, I sometimes referred to the VAFB public viewing location as Eagles Nest, when in reality the name is Hawk's Nest. Ok, ok , I got my bird names mixed. The same thing happened, some time back, when I referred to the doors on the new Tesla X as "gullwing doors". Wrong! Tesla, like SpaceX, is into Falcon wing automobile doors and Falcon rockets. Which reminds me to mention the great way we travelled to the Hawk's Nest. 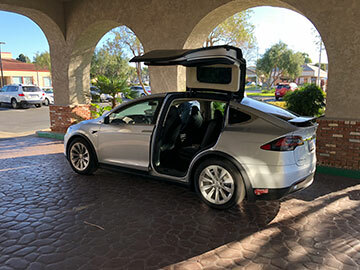 Check out the photo below which shows my winged chariot just waiting for me as we left our Lompoc hotel. Ok, ok, is was actually Science Nerd and Theatre Impresario, Sandy's new Tesla X. It sure was fun to ride around in that vehicle and when the driver put the pedal to the metal, the Tesla's electric propulsion accelerates so quickly that you are literally pushed back into seat. It is almost like a rocket! Pretty neat! Thanks for the ride, Sandy (and Scott)! Ok, the rocket launch was not the only event happening this week. 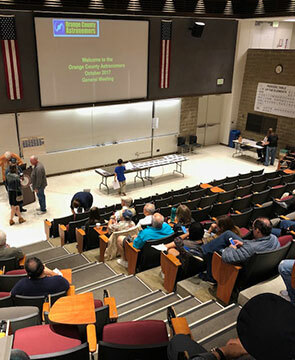 The OCA general meeting was conducted a week early this time due to Chapman University use of their lecture hall on the originally scheduled date. Anyway, Resident Astronomer Peggy was still in San Diego area, so I showed up at the meeting by myself and got there this time with plenty of time to find a seat in the auditorium. 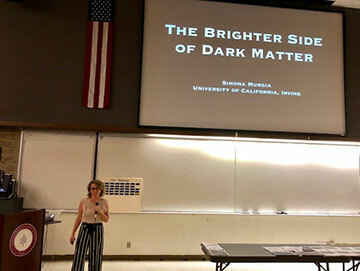 The OCA guest speaker this week was UCI Professor Simona Murgia who spoke on "The brighter side of dark matter." She described how the evidence for dark matter is based on several separate lines of observations, such as CMB measurements as well as galaxy rotation curves. So, in accordance with three separate lines of evidence, dark matter of some type must be present. But what is it? The bright side of dark matter is, even though nobody knows or understands what dark matter is, that the ongoing measurements and searches are ruling out many conjectural theories and suppositions about dark matter and leaving a reduced set of options to look for. Many theories as to what dark matter is posit that the dark matter is some sort of particle and that the particle's existence can be identified by very weak interactions with other ordinary matter. Many of these posited type of dark matter are based on various extensions to quantum field theory and the standard model of particle physics. This was the point that was currently of special interest to me because I have for a number of years now, when I wear my physicist wannabe hat, been studying. It turned out that in discussion following the lecture, another UCI professor, Tim Tait, mentioned that he was thinking of using a particular book in a class he was preparing to teach. He said he thought this book would be much easier to students to learn from. Since dark matter goes beyond any particle already now and studied and included in the standard model, it is QFT that describes what other possible particles could have been produced during the big bang that are outside the standard model and would be good dark matter candidates. There are dozens of innovative models of dark matter particles, none of which have any experimental evidence. Hey, it turns out that I have that book. See below. Now I had tried for many years now to work through some of the other standard QFT textbooks, like those by Weinberg and Peskin & Schroeder, but this other text looks much easier to read and is more compatible for independent study. When I again reviewed my copy I found that yes, the chapter headings and sub-headings identified real physics type topics much more than just pure mathematical topics. 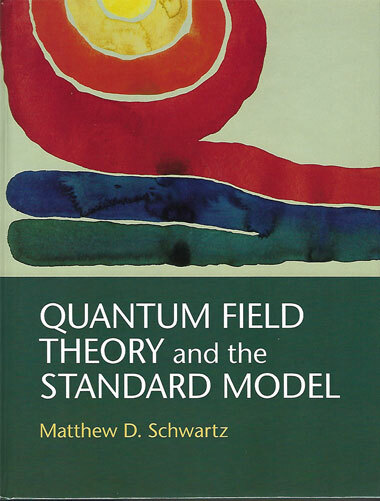 QFT is very mathematical, but this text seems to emphasize and refer to the physics first and then introduce the necessary mathematics. We will see if I can make my way through this textbook. As it turns out, when I opened up the book, the bookmark used in just chapter 2, was a receipt from Staples, dated January 2014. Hmmm, I guess I didn't get to far back then and apparently just gave up. Maybe now will be the time for success; I have been waiting four years after all! There were also many interesting astrophysics seminars at UCI this wee and I managed to fit one of them into my schedule. The seminar by J. Yoo, U. of Zurich, titled "Are We Ready for Precision Cosmology?" 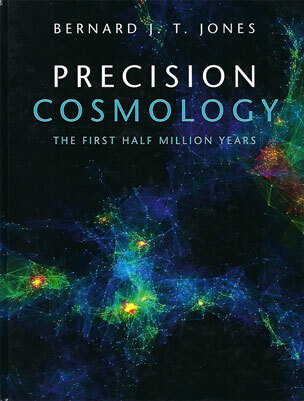 really caught my attention because I had gotten around to reading a book that I picked up at the COSPAR conference, titled "Precision Cosmology." I find the book an excellent source on cosmology as it covers the past 100 years of cosmological thinking. It starts with Newtonian Cosmology and then turns to Relativistic Cosmology and then moves on to the physics of matter and radiation and how measurement and observation are compared to detailed cosmological models. These is a lot of discussion on the CMB, starting from COBE and balloon experiments on to WMAP and then on to Planck satellite observations. So check it out! See the cover below. This text is one of the best books that I have found that covers how the field of cosmology has just recently become a precision science. It used to be that the Hubble constant was only known to a factor of two. Now the Hubble constant is known to something like 1%. So, when I saw the seminar title with the question mark regarding precision cosmology I was quite interested and had to attend. Professor Yoo discussed this same improvement in precision available now from astronomical and cosmological measurements. The problem he identified was that planned new galaxy surveys are going to be getting such precise data that the basic cosmological parameters should be able to be determined at below the 1% error level. But, at these low error levels the error built into the theoretical models cannot keep up without incorporating more and more of the non-linear and 2nd order effects that are predicted by and can be calculated with general relativity. He described many features of modern astrophysical measurements, all of which except gravity waves rely on light. Light and radio waves comes to observers here on Earth and we tend to think of these waves are propagating along straight lines. This is fine for many measurements but to achieve the same accuracy at below the 1% level, more complete relativistic effects must be taken into account. He talked about how gauge invariance in models is necessary, but not sufficient. Hmmm, let's just use the propagation of light through the varying gravitational field of the universe generated by all the intervening galaxies along the line of site between us and the target being observed. Those photons do not follow a straight line, as supposed, but instead follow their own world line as defined by the gravity of all the intervening galaxies and dark matter, too. Professor Yoo talked about the methods he and his team have been developing so that the theoretical models come up to the same precision as that which the newest galaxy surveys will achieve. So, it seems that we are indeed on our way to more precise cosmology. Although, I didn't understand many of his points, the graph below from one of his papers, shows the error that is present unless relativistic effects are taken more into account. 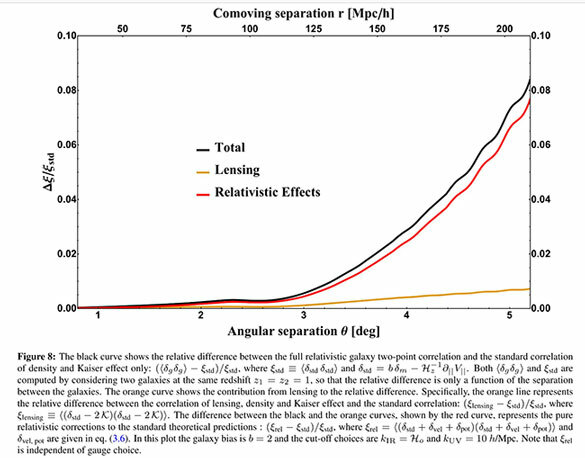 So what you can see in the graph that for galaxies with separation less than a degree or so, there is good agreement between the total effects as calculated by the gravitational lens equations and 2nd order relativistic equations. This is all fine and good for existing galaxy surveys already completed. The linear relativistic lens equation has been good enough up till now. But, in the future, with wider range of galaxy surveys with 3-5 degrees of arc separation, the standard lens calculations now no longer are sufficient and the full computation of general relativistic effects must be included. Thanks for that talk, Professor Yoo! This is an outstanding venue, with great and thoughtful staff, and a fantastic chef. The location of venues in Los Angeles is well situated. We has been delighted to host our annual event at this location for the past few years, and the space has been perfect for our group of roughly 300.